Over the past eight years, Poets&Quants has become the foremost authority for information on the top business schools in the world. From the start, our mission has been to help young professionals with one of the most important decisions of their lives: whether to get an MBA degree from a highly selective business school. Outside of buying a house, it could well be the most expensive decision you will ever make. An editorial partnership between Poets&Quantsand mbaMission, a leading admissions consulting firm, has enabled us to provide Insider’s Guides for FREE to our readers. What do our Insider’s Guides offer? A more thorough analysis of a school will not be found elsewhere on the web. These in-depth reports are well-researched and well-written. They contain the kind of detail and analysis that will help an applicant gain a real feel for a school, its culture, offerings, and outcomes. Obtain your FREE Insider’s Guides by simply completing the form to the right. 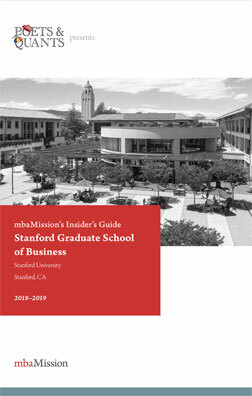 You will automatically gain access to guides for the following schools: Columbia, Johnson, Tuck, Fuqua, Harvard, Sloan, Kellogg, Stern, Stanford, Haas, Anderson, Booth, Ross, Darden, Wharton, and Yale. Download and print one or all schools of interest. As always, we invite you to email us with your questions, comments, and feedback. These guides were previously only available at a cost of $25 each. Thanks to our partnership, we are able to offer all of them to you at no cost — a total value of $400. After completing the questionnaire, all sixteen Insider’s Guides will be available immediately for download.